Safari employs certified canine rehabilitation specialists that are armed with comprehensive rehabilitation tools and modalities for healing therapy, enhancing your pet’s quality of life and for bringing the stem cell treatment the full circle of success. If your pet requires postoperative rehabilitation, performance training, maintenance rehabilitation therapy or regular exercise in general, Safari has the tools to help you and your pet reach your goals and desires! Additionally, FitPAWS® is an official sponsor of the University of Tennessee’s Certificate Program in Canine Rehabilitation (the first and only university-based animal rehabilitation certification program since 1999). 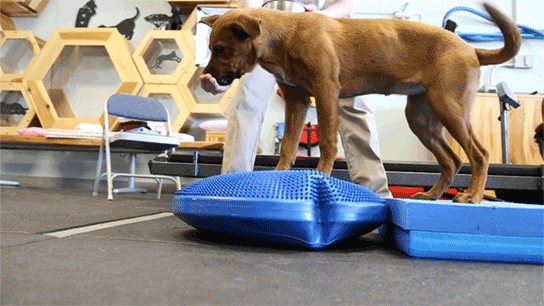 FitPAWS® Canine Conditioning Equipment is used in UT’s teaching labs and by UT’s faculty. Dr. Garner and his wife Dr. Susan Mooney/Garner have both attended and successfully completed UT’s Canine Rehabilitation Certificate Program. Cavaletti is a great physical and mental workout with many advantages. Originally designed for horse training, cavaletti exercises are small jumps over rails that are elevated off the ground. The rails are of a specific length and spaced at specific intervals. The height is adjusted according to the size and postoperative needs of the pet. If cavaletti is new to the pet, the poles can be set on the ground and the height can be gradually increased as the pet advances. Cavaletti is excellent for mental stimulation, strengthening muscles, balance, stability, flexibility, coordination and is exceptional for building proprioception skills (the ability to know where the feet are in space at any given time). Cavaletti exercise is also great for correcting poor walking habits, such as feet shuffling or pacing. These next three lessons, involving pilates and obstacle courses, are designed to strengthen core muscles as well as to work on specific leg muscles. Balance exercises not only improve balance and confidence, they strengthen joints by making micro movements which exercise the muscles surrounding the joint. 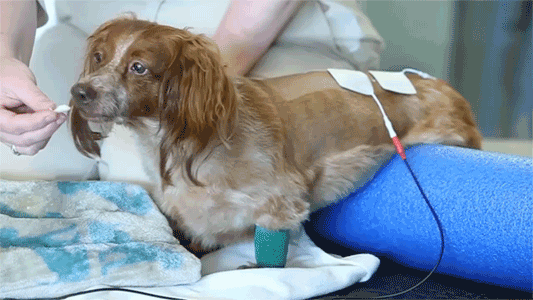 Improving balance and coordination is an important component of improving mobility in pets with chronic arthritis, post–surgery or recovering from injury. “Teaching Kickback Drill” teaches pause points such as “2 On 2 Up”, kickback, and “2 On 2 Off” is the first step in kickback bridges for hip extension, lower core stability, body awareness and muscle strength. Pilates are great low impact exercises that builds strong core muscles, balance, coordination and flexibility. The exercises are both physically and mentally challenging, because they have to constantly think and figure out where their body is in space, thereby creating excellent proprioception skills. Pilates are beneficial to arthritic pets because the exercises reduce swelling in the joints, increase blood flow and strengthen tendons and ligaments. Additionally, by maintaining proper movement and flexibility, pilates can help prevent injuries and help heal surgical corrections. As their fitness level improves, the obstacle course advances to include a variety of modalities. Your pet will not only feel healthier, they will be healthier and happier. Overall, the benefits of pilates are balance, coordination, flexibility, conditioning, body awareness, strength and confidence. Pilates are beneficial to any pet at any fitness level, rather it be for postoperative surgery, maintenance therapy, canine athletes, performance dogs or the couch potato. Safari has the training tools and certified specialists to get your pet started and to keep them going strong! The wobble board is an excellent tool for multi-directional balance, improving body awareness (proprioception), increased range of motion, core strengthening and overall conditioning. The wobble board swivels a full 360° and your dog will gain self-confidence as they learn to master changing and unstable environments by maintaining their center of gravity on the board. 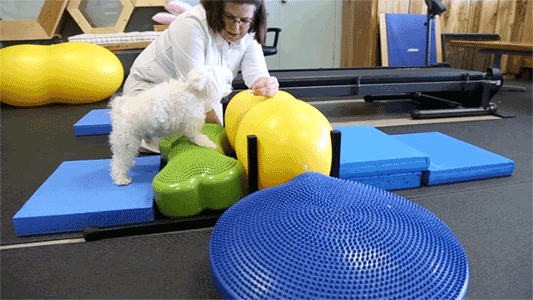 For rehabilitation, the wobble board can be used for targeting specific limbs for weight-bearing therapy and muscle strengthening. For the sporting and performance dog, the wobble board is a great cross-training tool to help keep them in top competitive condition. For maintaining strong joints, range of motion and mobility, the wobble board is a great tool for training regularly. Clinical studies have shown that laser therapy reduces pain and inflammation and, thereby, stimulates tissue healing, regeneration of nerve cells and reduces recovery time. Laser therapy can be used in addition to medication for pain management, or as an alternative to pills. Laser therapy is non-invasive, requires no sedation and is free from side effects. At Safari, we use a high-powered laser, so treatments take just a few minutes and can be performed on an out-patient basis. 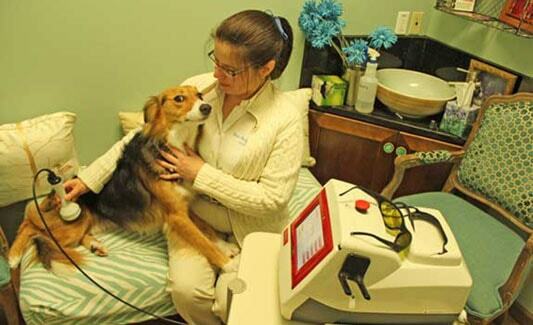 Laser therapy is suitable for all ages and all species of pets. Many pets show rapid improvement with reduced pain scores and less lameness after only 1 treatment. Treatment schedules are tailed to the pet’s condition and rate of recovery. Rowdy very recently received stem cell therapy and is currently undergoing rehabilitation to help him regain function and independence after losing the ability to use his hind legs. 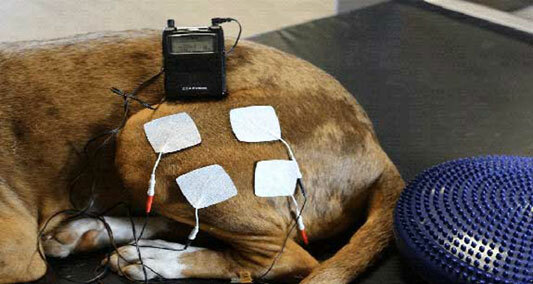 Electrostimulation Therapy (or NeuroMuscular Electrical Stimulation –NMES), is the electrical stimulation of muscles, or the nerves that feed muscles. The purpose is to make the muscle contract. This contraction of muscles is necessary when there is nerve damage to the brain, spinal cord or other nerves that feed the muscles, and they cannot move on their own. Electrostimulation is also beneficial in cases where there is trauma or surgery to the bone, joint or muscle that makes it too painful for the muscle to move without electrostimulation. Therapeutic ultrasound uses sound waves to deliver energy to tissues with two types of effects. Therapeutic ultrasound is primarily indicated in the treatment of chronic scar tissue and indolent decubital ulcers (bed sores). It may also be effective for palliation of muscle spasms and for enhanced tendon healing. Therapeutic ultrasound offers many benefits, some of which are heat energy delivered to tissues, increased blood flow, flexibility and extensibility of connective tissue, pain relief, decreased swelling and muscle relaxation. When Queenie arrived at Safari in May of 2017, she could not use her back legs due to paralysis from IVDD (Intevertebral Disc Disease). Unfortunately, 25% of the Dachshund breed will develop IVDD. Queenie underwent previous decompression surgery, however, to no avail. Afterwards, Queenie received stem cell treatments at Safari and rehabilitation to strengthen her muscles and relearn to walk. The underwater treadmill is an essential rehabilitation tool to build strength without damage to the surgical correction. 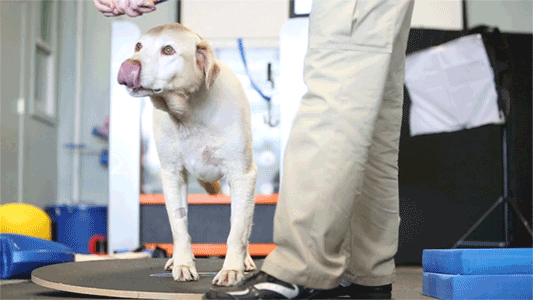 Just four weeks after stem cell therapy, Queenie can walk again! As this video progresses, so does she; notice the difference in her rear limbs and how she is trotting through the water towards the end! 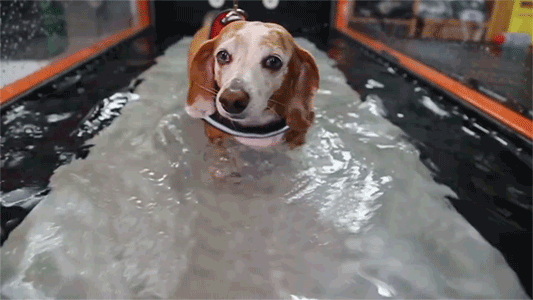 As you can see, the underwater treadmill, stem cell therapy and other rehabilitation modalities are not just for dogs! Flacka the ferret was brought in by her family to see Dr. Garner after she suddenly lost the ability to use her hind legs. Flacka was diagnosed with IVDD and treated with stem cell therapy and rehabilitation. Flacka’s movin’ good now! 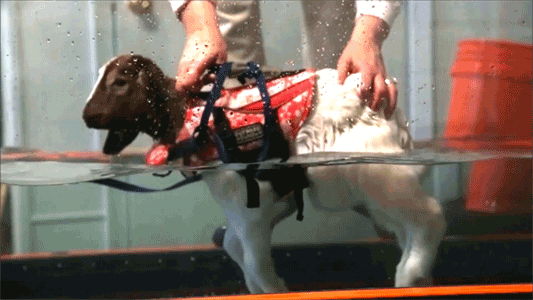 Just another day at Safari and this time Ginna the goat visits us for underwater treadmill rehabilitation. As you can see in the video, Ginna is undergoing strength and balance training. 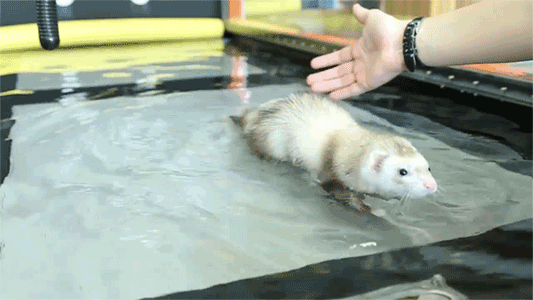 The water treadmill is state–of–the–art in pet rehabilitation and has long been respected as the tool to use to rebuild strength. The water buoyancy takes much of the weight off the joints so that movement can occur more naturally and pain free, while the moving floor encourages walking, the warm water increases circulation and provides resistance to movement that aids in building strength. 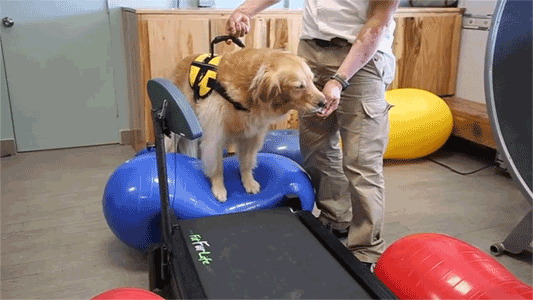 Land (or dry) treadmills are an advancement for the pet that can use and bear weight, but still needs to work on coordination. 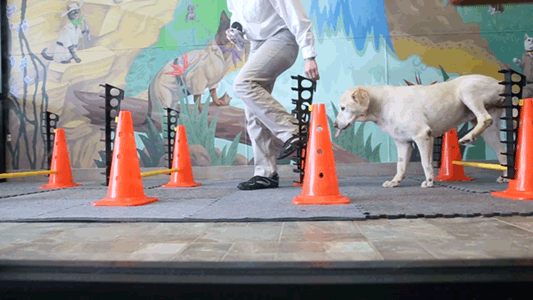 In this video, Safari Pet Rehabilitation Center is showing how skilled a pet can become at workouts. 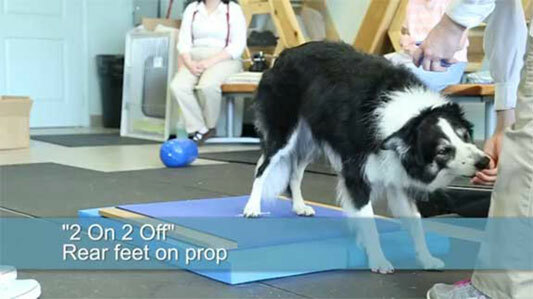 This therapeutic exercise is used to extend the range of motion of the hind-limbs creating a more athletic pet. 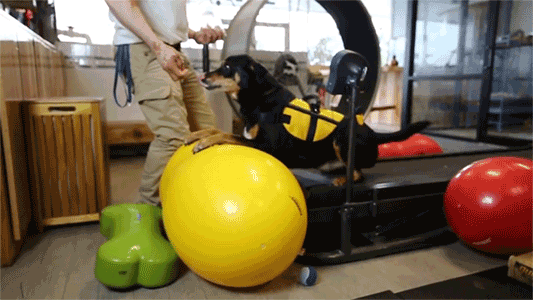 This pet is Post-Operative at Safari after Cranial Cruciate Ligament Surgery (tightrope procedure) and this is the first day on the treadmill for her. 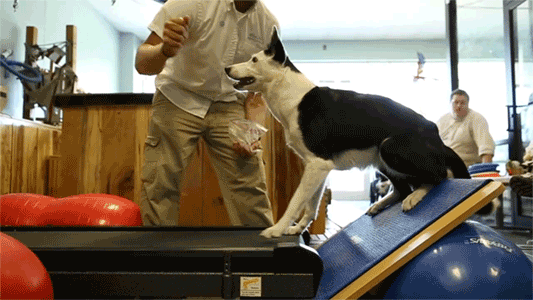 The land treadmill is used to build proprioception or knowledge of the location of the limb. This exercise promotes both balance and coordination. As you can see the right rear leg is still weak, but is trying to work. She is doing very well. Jasper has severe arthritis in his elbows. The purpose of this exercise is to improve his forelimb balance and core strength. Today, Jasper continues to visit Safari with his Mom regulary for underwater treadmill maintenance therapy.